Recollections of Killdeer, North Dakota - The BSB SportzMan - A Forum for OutdoorzMen! This letter about the history of Killdeer, North Dakota, and of his family there, was written by Richard F. David, to the editor of the Killdeer Herald. It was dated April 25, 1983, a little over two months before his death on July 2, 1983. With the omission of one or two minor typographical errors, it is reproduced below just as he wrote it. I was born in Killdeer 64 years ago, in Dr. Oscar Smith's hospital (later the Suckstorf house, next to my Grandma David's). My parents, Fred and Pearl (Smith) David, both came to Dunn County in 1909. Most early Killdeer and Dunn county history I have seen emphasizes the early ranch history. Of equal importance to the development of the area were the early pioneer homesteaders. My father, Fred David, came to the Killdeer area in 1909 with his brother-in-law, Tom Sheaffer, and his friend, Jack Kobitische. All three came from Wisconsin. My father told of getting off the train with his friends at Dickinson and seeing an overturned wagon box on the dirt main street. Upon inquiry the young men were told that the overturned wagon box covered the body of a man who came out second best in an argument and the locals thought it only proper to cover the body until the sheriff returned to town. David and Sheaffer homesteaded on adjoining quarter sections seven miles north of Killdeer, where they built sod shanties 100 yards apart. Kobitische homesteading several miles west, near the Killdeer mountains. I recall my father telling of hauling his wheat 40 miles to Dickinson (there was no Killdeer then) in double boxed wagons, four-horse drawn. At the halfway house south of Manning, they stayed overnight. On the return trip, with an empty wagon, one day sufficed. He also said that in the first years of cultivating the virgin land, 40 bushel wheat was not uncommon. My sister, Dorothy (David) Yule of Littleton, Colo., was also born in Killdeer (65 years ago) in her grandmother Smith's house. This house was later Leone Rasborough's. Dorothy lived briefly in the aforementioned sod house before a frame house was constructed. My brother, Donald David of rural St. Paul, has in his possession a perfect 3-1/2" flint spearhead, grooved on both sides, which my father dug up in a ravine while looking for spring water for his cattle. Along with the spearhead were buffalo bones, the evident result of a wounded buffalo eluding an Indian hunter. According to my parents, in those early days before the land was tilled, large buffalo "wallows" were commonplace. Many buffaloes would roll in the dust to be rid of flies and other insects. One of my earliest recollections was the excitement of threshing time. In the north Killdeer area harvest was accomplished with a community thresher, with each farmer supplying workers in proportion to his own acreage. To the best of my recollection the threshing started at the Fettigs, the Noel Lewises, George Vollmers, Mittlestads, Fred Davids, then up the "Island" to Bob Marty's, Kobitische's, and Dullums. The Big Gould farm, I believe, had their own thresher. My mother, Pearl Smith, also came to Dunn County in 1909. She taught school one year near Emerson before moving to the Killdeer area. She boarded one term at the Willcox-Richards ranch west of Killdeer before homesteading near Crosby Butte and teaching at the Gould school. She and Cora Palmer were the first teachers of the Killdeer school. While she was living on the Crosby Butte homestead, it was not uncommon for her to dismiss her school Friday noon and ride 40 miles to her parents' home in Dickinson, arriving there in the late evening. Her Tennessee Walker horse "Maude" was such easy riding that many people needing to travel to Dickinson would borrow her for the trip. Pearl Smith's brother Clifford drove the stagecoach from Dickinson to Killdeer from 1910 to 1912, and another brother, Clyde, built the two-story tin-sheathed Killdeer Hotel, on top of the hill, in 1914. My parents talked often of Oakdale, which was not only THE trading center north of Manning, but a social center as well. They told that at one time Oakdale boasted a store, blacksmith shop, bank and dance hall. In 1910, it was recalled, a posse from the Roosevelt ranch at Medora came through Oakdale pursuing a gang of horse thieves. They caught them in the "Breaks", and were returning to Medora with them, again through Oakdale. On finding that a big dance was scheduled there that weekend, the posse either locked the horse thieves in the blacksmith shop or hung them, so the posse members could be free to attend the dance. My father assured me the "locking in the blacksmith shop" tale was the true version. Since leaving North Dakota some 40 years ago, I have read several theories about the Killdeer Mountain "Medicine Hole" in your paper, in the Dickinson Press, and in several pamphlet type brochures. The story your newspaper carried seems the closest to fact, but all accounts toyed with the idea that the escaping Indians from the Sibley battle might have escaped down the Medicine Hole, emerging some miles away. For several thousand Indians to escape down a hole three feet in diameter and hundreds of feet deep would require some strong magic! It would be much more logical to subscribe to the idea that the retreating Indians escaped over the Killdeer Mountains and, unable to take their dead with them, dropped them down the Medicine Hole. My parents told me that from the time they came to the Killdeer area in 1909 to the late 1920s they saw or had knowledge of the annual visits or pilgrimages of the Sioux medicine men to the Medicine Hole, where they would drop down tobacco and herbs and hold ceremonies for their departed tribesman. I visited the Killdeer mountains many times as a child and spent four summers there with the Alley Palmers. I can recall vividly sitting on the porch of the Oakdale store and listening to Mr. Palmer dispense wisdom, advice and small personal loans to the area farmers and ranchers. At that time Oakdale and the Palmer lawn, flowers and garden would have to rate as one o the finest beauty spots in the state. Hundreds of area people were made welcome there for their picnic outings, which almost always included climbing the mountain to the Medicine Hole. I have been reliable informed that Jim Palmer descended over a hundred feet into the Medicine Hole in the late 1930s, and that it was later dynamited shut for safety reason ? and later dynamited open again. Theresia Essert of Dickinson tells me a Catholic priest went even further down in the 1940s, and cleared some of the obstructions. If you are tracing early history in the Manning area you might contact Mrs. Leslie Pelton (north of Killdeer) or Ethel Jane Palmer Erbsoesser of Golden Valley for information concerning their mother Ethel. She and her first husband, Mr. Owens, had considerable acreage in the Manning area. After his death she married Alley Palmer, and they bought the Red Murphy Oakdale acreage, probably in the early 1920s. You may have known her as Ethel Pierson. I grew up in Killdeer, and worked at the Killdeer Herald for Nace Doherty, first as a devil and later as a linotype operator after going to school at Wahpeton Science. My wife Ann and I met and were married in Dickinson, where we both worked at the Dickinson Press, I in the composing room and she in the editorial department. We have had our own papers in Kerkhoven, Minn.; Eldon, Iowa; Buckeye and Gila Bend, Arizona; and have now retired as publisher and editor of the Ajo Copper News in southern Arizona. Two of our three children are now running the Copper News, and another is studying at the University of Arizona. Ajo is a copper mining town, just now starting to pull out of the "recession." It is a quiet and friendly town, and is a refreshing green spot in the miles of desert that surround it. We are forty miles north of the Mexican border, 120 miles west of Tucson. Two men seated on metal bucket and stool each milking a cow. Taken in pasture surrounded by fence and trees. Several people standing by fence. 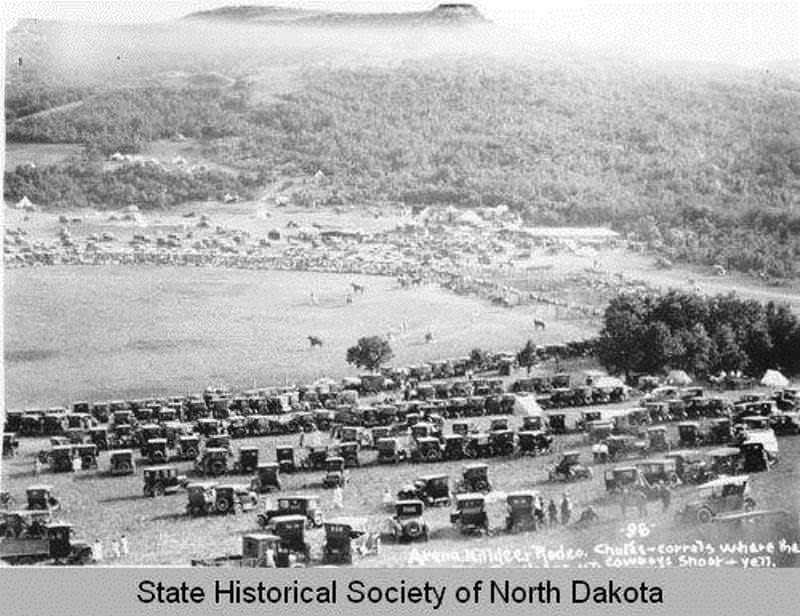 Oakdale, North Dakota - 1926. From the beginning at Oakdale, one of the trademark attractions to the Killdeer Rodeo was the hillside arena. This image from 1924 shows how the tradition started before the rodeo moved into Killdeer. 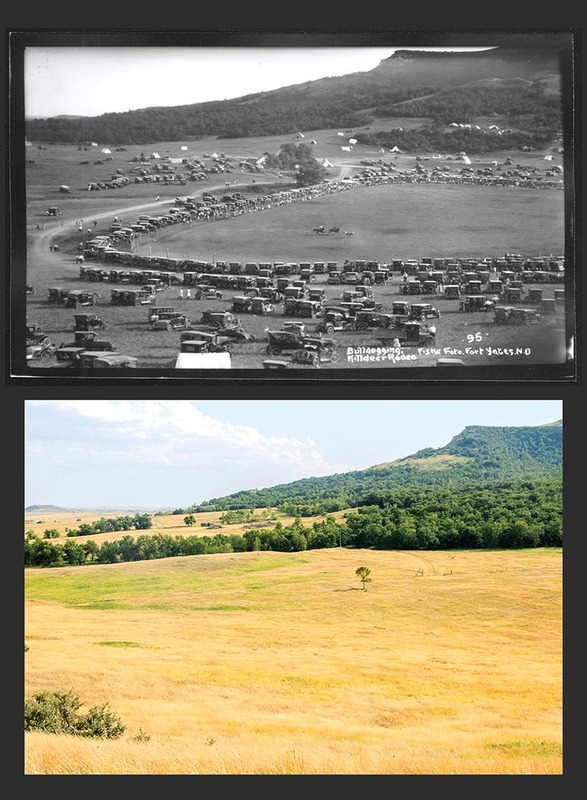 On top –The Killdeer Mountain Roundup attracted hundreds of spectators from across the region who bounced down old rutted gravel roads to park their jalopies on the hillside. Below — This is what that same valley looks like, these days. Starting with the first gatherings at Oakdale in 1924, and continuing to today, the core group of locals put in the work to keep it going. The Killdeer Mountain Roundup Rodeo is the oldest Professional Rodeo Cowboys Association (PRCA) sanctioned rodeo in the state. It’s the long tradition of local cowboy competition that makes this rodeo unique of all the rodeos in North Dakota. about 20 years ago, I hunted that area. Seem to remember an area called Black Butte"? It's very possible, Bear - the only butte I know for sure is a Crosby Butte, which came into play during the Battle at Killdeer Mountain. My aunt who lives in Keene, North Dakota, paints pictures of wildlife and landscapes, and I am sure that I remember her painting a scene with deer that had Black Butte in the title, so you could very well be remembering correctly. Actually I was staying in a ranch house near Keene. Hunting PDs. If their name was Brown, I am probably related. My cousin, Jimmy Brown, runs an outfit called Cherry Creek Outfitters.